Now that spring is officially here, there is no better way to embrace the warm weather than by adding a new ceiling fan to your rental property. Keying in to the trend toward urban lofts, condos, and apartments, Gould says that there has been a surge in the number of fan designs that cater to this type of room space. She suggests using hugger and low profile ceiling fans for smaller living spaces. These styles have a smaller blade span and dont hang very far from the ceiling, making them ideal for small rooms or rooms with low ceilings, notes Gould. They say that when you truly love something, it never goes out of style. Lamps Plus offers a unique online tool that allows you to match other room elements by customizing the number of motors, blades and light kit options to get just the fan you want. Conserving energy is always a stylish option, especially during those hot summer months when cooling and water bills tend to spike. There now are a number of chic energy efficient ceiling fans to help minimize your impact on the environment (and your wallet!) Look for Energy Star rated ceiling fans or designs with good airflow efficiency ratings, says Marcia Prentice, interior designer and design blogger for the Lamps Plus Style Illuminated blog. Why limit yourself to the indoors? Nowadays, there are hundreds of stylish options for outdoor ceiling fans that provide just the right amount of air flow to add comfort to those common areas where tenants congregate on warm weather days. 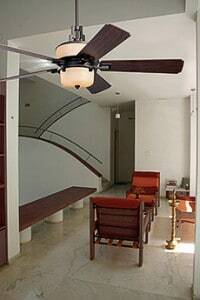 Many factors contribute to the overall quality of a ceiling fan, none more so than the motor. Avoid fans with motors that are undersized for the job or poorly constructed. These are the most likely to make annoying noises, and that means tenant complaints. A precision die-cast aluminum motor offers a long lifespan, superior air movement, and is extremely quiet due to the lower operating temperatures and aluminum body enclosure. Blade pitch and construction also must be considered. Generally speaking, the greater the angle, or pitch of the blade, the more air the fan will move. Blade pitches between 12 and 16 degrees offer good, efficient airflow. The combination of a heavy duty motor and high blade pitch makes for an efficient and well-engineered fan. You should also consider the blade span when choosing a ceiling fan. Simply opt for a larger blade span when cooling a larger space, and a smaller blade span for smaller spaces. Blades should be made of multiple layers of pressurized hardwood to eliminate warping. Finally, take a look at the fan controls. While this may be the last thing you think of when buying a ceiling fan, the correct remote control unit makes the operation of your fan much more convenient. Controls are classified as basic pull chain, hand held remote control, or wall control. If your ceiling fan is going to be installed in a bedroom, a hand held remote control lets you make the adjustments without having to get up. In other rooms, either a wall or remote control will keep you from having to reach for the fan every time you need to make an adjustment. This is especially worth noting if your fan is centered over a table or other furniture. For more fan inspiration, or to browse designs, check out the design gallery at Lamps Plus.